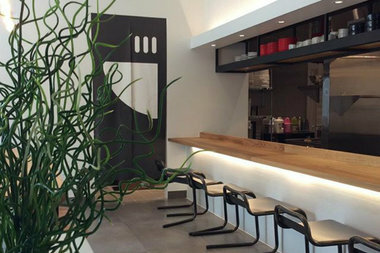 Jun-Men Ramen Bar, at 249 Ninth Ave., opens on Thursday. CHELSEA — A new ramen shop that fuses Eastern and Western cuisines while offering a gourmet twist on the classic noodle dish is coming to the neighborhood. Jun-Men Ramen Bar, located at 249 Ninth Avenue between 25th and 26th streets, will open its doors Thursday, its owners said. Menu items include Kimchi Ramen with roasted pork shoulder, a French-inspired ramen bowl with uni, roasted pancetta, porcini mushroom butter, fried shallots and scallions, and a Yellowtail ceviche dish with kimchi jus and mango. Sake-infused ginger lime and lychee cucumber cocktails will provide lubrication throughout the meal, and for a sweet denouement there's the chef's signature coconut rice with sweet milk, almond bread crumbs and dark chocolate shavings. Jun-Men Ramen Bar is the first solo project for Korean-born chef and owner Jun Park, who studied French cuisine and worked as head chef at Zutto Japanese American Pub in TriBeCa. Ramen dishes are priced up to $18, while cocktails and deserts are $8, according to the restaurant's menu.